Nearly 20 per cent said they didn't know her at all. Ontario provincial NDP Leader Andrea Horwath takes questions from journalists during a pre-budget lock-up, as the Ontario provincial government prepares to deliver its 2018 budget at the Queen's Park Legislature in Toronto on March 28, 2018. Ontario's NDP leader has a chance to make a big impression on voters, but she also only has seven weeks to do so. 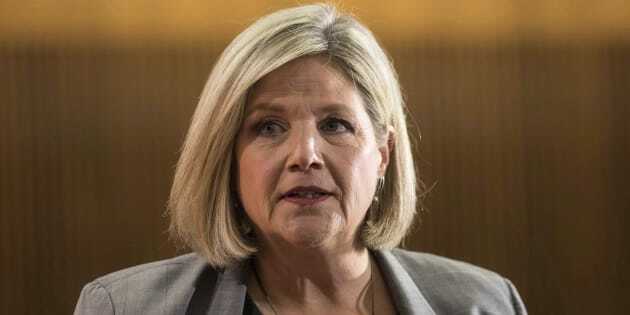 A new online survey of more than 4,100 Ontarians aged 18 and over found that a small majority either don't know Andrea Horwath well or don't know her at all. The survey from OnPulse, which is a research program focused on the June election, asked voters how well they thought they knew the three biggest provincial party leaders. Nearly a third (27 per cent) said they didn't know Liberal Leader Kathleen Wynne well or at all, 38 per cent were unclear on Progressive Conservative Leader Doug Ford and 53 per cent didn't have a good sense of Horwath. The party leader, who has been in the job since 2009, may still have a chance, though, because fewer have made up their minds about her. Of the three leaders, the highest number of respondents viewed her either neutrally or didn't know enough to have an opinion. More than 60 per cent viewed Wynne negatively, compared to 35 per cent for Ford and 15 per cent for Horwath. "Given the polarized nature of views towards her rivals, the NDP and Andrea Horwath are well positioned to appeal to voters who want change but may not feel comfortable with Mr. Ford and those who may like what the Wynne government has done but fear a Ford win," wrote survey report author David Coletto. The NDP released their fully costed election platform Monday, promising free child care for low-income families and more funding for hospitals if they win the spring election.